You’ve successfully found a parking spot, but it’s not in an ideal location. Maybe it’s a steep hill or you just aren’t sure your car’s manual transmission will stay in gear. That’s what the parking brake is for! Wait a sec . . . is it a parking brake, or is it an emergency brake? What is it designed to do, and how does it work? Check out this explanation of how a parking brake works and what can go wrong. What Is the Parking Brake? In some vehicles, there’s a lever in the centre console and on others, it’s an extra foot pedal in the driver’s footwell. Many modern cars even have a button on the console that electronically engages the parking brake. In all cases, the fundamentals are the same. The parking brake is designed like rudimentary drum brakes. And if a car is equipped with rear drum brakes, they double as the parking brake too. A sturdy steel cable runs from the handle or pedal in the car’s passenger compartment to the rear brakes. When the pedal is pressed or the handbrake is pulled, the cable engages the parking brakes at the rear wheels. An equaliser splits the single cable into two, spreading even parking brake pressure to both rear wheels. But what does the parking brake hold onto? When the parking brake is engaged, it forces parking brake shoes to squeeze tight against the inner surface of a disc brake ‘hat’. The friction holds your car in place so it doesn’t roll. What Can Go Wrong with the Parking Brake? Used properly and regularly, the components of the parking brake system will last a very long time – often through many other sets of brakes! There are a few problems that can occur, however, especially related to improper use. Worn parking brake shoes. The parking brake shoes can wear out, just like normal brake pads. You’ll find this is often the case if the parking brake is accidentally left engaged for a long time or if it’s improperly adjusted. Seized cables. The parking brake cables need to move freely in order to engage and release the parking brake. Lack of use and lack of lubrication can lead to seized cables that mean the parking brake gets stuck engaged, won’t engage, or the cable breaks. Doesn’t hold tight. 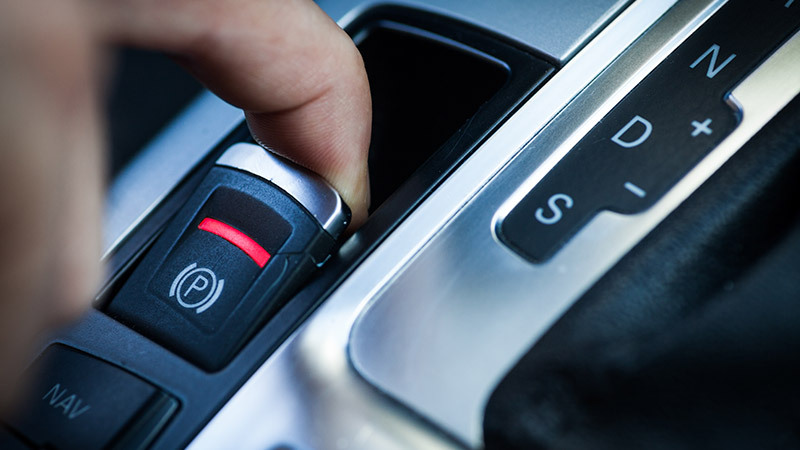 The parking brake should prevent your car from rolling when it’s engaged. If it doesn’t, the brake shoes may be worn out or the parking brake is out of adjustment. Can the Parking Brake Be Repaired? Most parking brake concerns can be quickly addressed by servicing the system by lubricating and adjusting the parking brake’s components. A broken or seized cable or worn out parking brake shoes can be replaced, just like any other braking system parts. What Does a Parking Brake Repair Cost? You won’t break the bank with parking brake repairs. Depending on how involved the repair is, the average cost will be between $45 and $390. If you’re having troubles with your parking brake, you can quickly book yourself in with a fully qualified mechanic on AutoGuru. We’ve got instant quotes, transparent prices and a hassle-free experience!